drafty sort of poem for Brendan’s prompt on Real Toads about voices in our heads, and also for open link night. 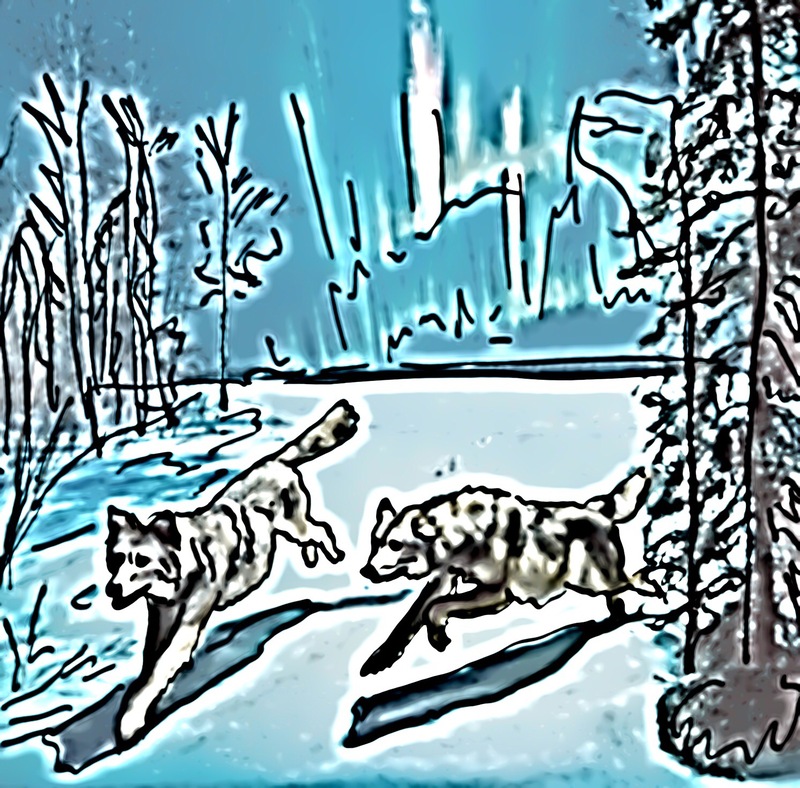 Drawing is mine but based on diorama at the American Museum of Natural History in New York. This entry was posted on January 24, 2017 at 9:02 pm and is filed under poetry, Uncategorized. You can subscribe via RSS 2.0 feed to this post's comments. I believe it does – our energy goes out into the world and shifts things a little – much like that butterfly effect. I love your beautiful wolves. Love the voice inside as a wolf. Maybe we need that voice, but I wish to have the power to silence it at times. Liking this, K. At the end, will the ‘wolves’ join the hoards of other animals now extinct, their extinction brought by the selfish and inhumane acts of man? God bless the zoo keepers. There’s such clarity here, K — how the “call” for inner change refused to “cry wolf” but instead becomes the shadow of wolves on a wall of a field, foraging. Rilkean transformations of that which is great within and yet small. Thanks for the round two. No crying wolf but that constant carping. I like this. As if you could affect them. May as well go with yes, you can. We are left with seize the day …. I love to see your wit at play here, Karin, even when you write about the tough subjects. We rise up first in thought and then we step out and carry our message. Great poem… We must trust we plant change through our convictions.